It seems that every year there are more and more people who dress in costume when they attend their local Renaissance Faire. Is it really more fun? What do you need to make your costume great? Well, let's find out. 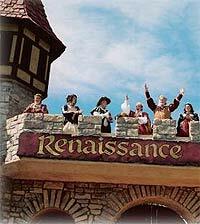 I attended my first Renaissance Faire about 11 years ago. I took my two boys (then ages 6 and 8) with me. We all had a blast! The costumes were fabulous! The shows were wonderful! The shops were fantastic! The games were genius! The King and Queen's Court was impressive! And, the jousting was amazing! The only thing that would have made it better would be if we had been in costume, too. But it was my first Faire and what did I know? Well, you can rest assured that the next year when we went to Faire, we were all dressed in costume. And you know what? We all had an even better time than the year before! As we approached the entrance, the minstrels and players acknowledged us as Lords and Lady and complimented us on our appearance. It was wonderful to see my boys beam with pride as they were recognized by the performers. The boys had a great time attending to the period games and rides and seemed to feel much more comfortable interacting with the game attendants and wandering minstrels. It was as if they had almost transformed into true medieval lads romping about a medieval village. I must say that it was a magical day for us all and we were, all three, reluctant to leave as the sun began to set on the Faire. We all vowed that we would return again the next year and the vote was unanimous that our return absolutely MUST be "in costume." If you decide that you'd like to attend your local Renaissance Faire in costume, here are some tips to help you with your costume. When shopping for children who have the pesky tendency to just grow right out of their clothing, try to buy the clothing a bit larger than what they need right now. 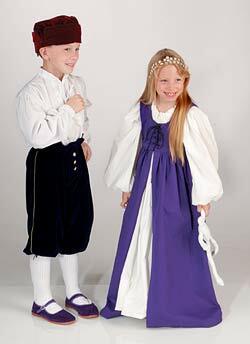 The Child's Commoner's Vest, Little Lady's Chemise and Little Lady's Irish Dress are designed to be size flexible to accommodate several sizes through a child's development. The natural fiber fabric and tough seams ensure that they'll grow out of these clothes before they wear them out. That should give you a good idea of the quality of these clothes. Our ancestors wore hats and veils for a reason. Aside from the fact that they didn't want to mess with their hair everyday and hats would easily hide their untidy locks, hats are also good for keeping the sun off of your head, and brimmed hats, like the Elizabethan Cap, will keep the sun out of your eyes. Hats like the Muffin Cap hide modern hairstyles and are versatile enough to wear a number of different ways. Ladies can also use a snood or a veil to keep the sun off their head or conceal a modern hairstyle. The right hat not only completes your costume, but it will also help keep you comfortable whether it is hot or cold at the Faire. Some other ways to "battle" the weather during your day at the Faire are to bring an umbrella or a parasol to provide shade when none other is available. And while it distracts a little from the ambience, please either protect your eyes with a brimmed hat or sunglasses. a skirt, to keep you cool. The proper Lady should start with the correct undergarments for maximum comfort. Start with a chemise and bloomers. A chemise is usually a full-length under-dress made from a light fabric (like cotton) that is easily washable. This garment is designed to sit next to your skin and absorb any sweat that might soil your outer gown. 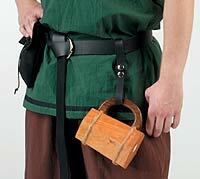 Bloomers are wonderful for preventing chafing if you happen to attend the Faire on a warm day. 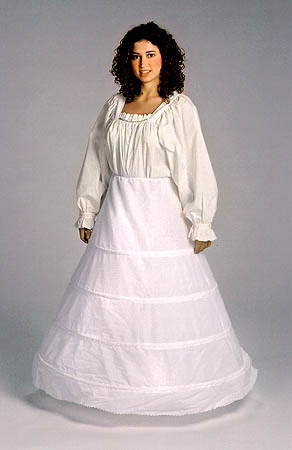 Hoop skirts hold big skirts out from the legs at an attractive angle and have the added benefit of allowing air to circulate under the skirt to keep you cool on a warm day. Next you will want to find the perfect gown, dress or bodice and skirt. These items are usually made from more elaborate fabric since they will not need to be cleaned as often as your chemise and bloomers because they rarely come in contact with your skin. Finish off the outfit with a few accessories like a hat, snood or veil, a belt with a pouch and one or two tankard straps (these are great for holding your keys) with a tankard, and any jewelry that will compliment the outfit. Finally, I recommend socks and comfortable shoes or boots. I place heavy stress on the word "comfortable." Sandals and open-toed shoes are probably not a good idea when attending a Faire and heels are simply impractical for the sometimes rugged terrain. Even a pair of black tennis shoes would be better than uncomfortable shoes since they will rarely been seen from under your gown or skirt. The gentle Lord will need either a hat or a biggen. The benefit of a biggen is that it can be wetted at the water fountain and then placed on the head to cool off on a hot day. Next, he will need an undershirt of light fabric (cotton and other natural fiber fabrics breath well while polyester doesn't breath at all and can make it seem like you are wearing a plastic bag), an over-tunic like a doublet, jerkin, or a vest (this can be removed if the weather gets too warm or put back on if it cools off). Again the over-tunic can be made of a more elaborate fabric because it will rarely touch your skin. Don't forget pants, of course. Finish the outfit with a belt and pouch, a belt-knife, a tankard, one or two tankard straps, and any "manly" jewelry that will compliment the outfit. Perhaps a chain or a ring. For men, I recommend socks and comfortable boots. Boots make every man's costume that much more dashing. And if your Faire allows, you may want to wear your sword. A child's costume is less involved. Girls need a chemise and a dress made from fabric that is machine washable. Boys need a light undershirt and a pair of pants and possibly an over-tunic that is easily cared for. Both will need a hat or a biggen, a belt, and socks and shoes. I also highly recommend that you hang a favor (small scarf or tie) on their belt that bears the child's name and contact information should they be separated from the family. One thing to keep in mind is that clothing layers are your friends. If you dress in layers, then you will be prepared for whatever the weather may have in store for you. You may even want to bring a cloak or two in case it turns chilly or if you're planning to stay after dark. And finally, in each of our newsletters, we provide you with information and links to Renaissance Faires throughout the country. Check out the website of the Faire you are planning to attend and get information about the site. What will it cost to attend? Are there fees for parking and how much are they? What merchants will be in attendance and what do they sell? What kind of food is available and does it fit within your eating plan? Are you allowed to wear a sword, or should you leave it at home? These websites can be a wealth of information and are designed to give you the answers you need to make your day at the Renaissance Faire a great and grand adventure. With these tips, I have every confidence that you will be able to select a wonderful costume to wear to Faire and have the most magical day possible. If you need more help choosing the perfect costume, feel free to call The Renaissance Store and talk with one of our helpful sales people. They would be more than happy to share their wealth of knowledge with you. Vivat my Lords and Ladies! And have a grand time! If you want to add this article to your list of favorites or email it to a friend, please use this permanent URL, https://stores.renstore.com/-strse-template/0707A/Page.bok. Permission is granted by the author to quote from this page or use it in handouts as long as you include a link back to Renstore.com.